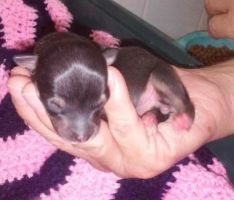 Chihuahua breeders links and breed information on pups4sale.com.au. 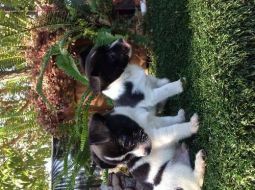 pups4sale testimonial: "I am just notifying you that all pups are sold. I would like to take this opportunity to extend a heartfelt thank you for all your help and wish you well in your wonderful site. Your professionalism is to be commended. I would not hesitate to recommend this site to my friends. Thank you." 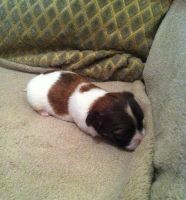 Who would have thought that such a pint-sized dog could embody so much mystery? Not only can the various moods of a Chihuahua be a guessing game, but their history, as well, is a puzzle! History: While it is widely accepted that Mexico is indeed the country of origin for the tiny Chihuahua (some believe it was China), the period of their origin is a bit iffy. 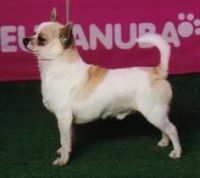 Though they are named for the area of Chihuahua in Mexico, this species likely developed from a breed of companion dog called Techichi, who were beloved by the ancient Toltec people. These dogs were so popular and so beloved, in fact, that artifacts depicting them as a part of society date from 300 B.C, and have been found not only in Mexico, but in Central and South America, and parts of the United States (as far East as Georgia)! For little dogs, they sure got around! But life was not all peaches-and-cream for the early Chihuahua. 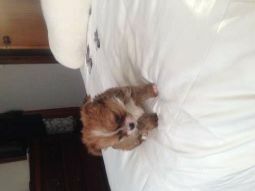 As it turns out, the Aztecs believed that such small dogs were necessary to guide a soul to Underworld. Due to that, a family”s dog would be sacrificed and buried with a family member upon their passing to help lead them into the Afterlife. If that wasn”t bad enough, ancient peoples also had a penchant for eating dogs. But as time progressed, life became less hazardous for the hapless Chihuahua, and the breed began to gain popularity for its more pet-worthy (less edible) traits. But, alas, bad luck struck again for the Chihuahua in the 16th century, when Cortes conquered the Aztecs. Of course, the Aztecs weren”t able to save themselves, let alone the Chihuahuas, so the tiny pups were essentially forgotten and abandoned, and the fate of the breed looked bleak. How they managed to survive over the next 300 years is unknown, but in 1850, a few remaining pups were found near Chihuahua, Mexico. During the next 50 years, the breed made a comeback, making its way into North America and Europe. Finally, in 1904, the first Chihuahua, named Midget, was registered by the American Kennel Club and the Chihuahua Club of America was formed in 1923. In 1954, the first Chihuahua, named Nellistar Mario, was registered in Victoria, Australia. Today, the Chihuahua has wiggled and shivered its way into hearts and homes world-wide. 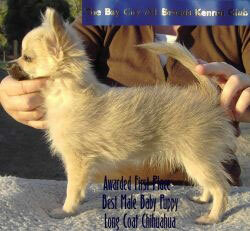 Breed Standards: – Not surprisingly, the Chihuahua is the smallest dog breed classified in many kennel clubs. 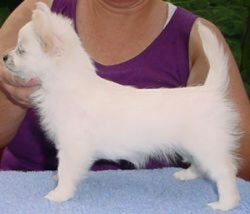 According to breed standards, there are two main varieties recognized: short-haired and long-haired. Within those parameters, there is also a secondary variety split with regard to the shape and size of the dog”s head: "apple head" and "deer head" (only the apple head is considered show-acceptable). In terms of size, the average height of both males and females is 6-9 in. (15-23 cm. ), with an average weight coming in at under 6 lbs. (2.6 kg.). Coat colors are wide ranging, including fawn, black, white, red, cream, chocolate, brown, and mixed, and any variation of markings is acceptable for show. Other characteristics include a body that is “off square” (longer than it is tall), eyes that are full and round (not protruding), large and erect ears, with small and delicate feet, and a short, slightly pointed muzzle. 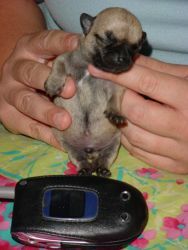 Your local Chihuahua breeder can help you further explore the standards and traits to look for in your Chihuahua pup. Energy: – Making it one of the most perfect small apartment, big city dogs, the Chihuahua does not require much exercise at all. It”s happy on a walk with you, exploring the back yard, or just following you from room to room in your home. But that doesn”t mean this dog is lethargic. Quite the opposite! Chihuahua owners will quickly attest that their pint-sized pooches have enough energy and personality for two regular-sized dogs! Its size also obviously makes it the perfect traveling companion (aptly nicknamed a “purse dog”). This little, determined dog can follow you everywhere…except into the cold. The telltale “shiver” or “shake” is mostly due to their reaction to cold, though it can also signal other issues (nerves, excitement, pain, earache, fear, or even low blood sugar). Temperament: – Two of the main personality traits attributed to Chihuahuas is their incessant shivering and their tendency to be “snippy.” Well, perhaps a bit of residual memory from their ancient ancestors (being sacrificed, eaten, and abandoned by Toltecs and Aztecs) has been left over and passed down the DNA chain? Such a harrowing life would certainly be cause to put even the biggest and bravest of us a bit on edge. In all seriousness, though, Chihuahuas have also been called “saucy” and “spoiled,” but as with so many other dog breeds, some of that excess of attitude can be attributed to training (or lack thereof). A highly intelligent dog, they need consistency and structure to learn. Despite their diminutive size, the Chihuahua is not a terribly fearful dog; they are very loyal and fiercely protective, often more toward one particular person (hence another nickname of “armpit piranha”). They are very alert and aren”t shy; they will certainly be vocal to get your attention, or to get what they want (which usually is your attention). The Chihuahua also does well with other family pets and gentle children (they are much more wary of strangers, though). 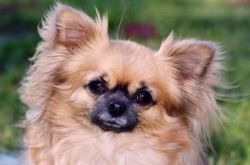 Health: – The Chihuahua, partially due to its size, has a very long life span of 10-18 years. If well cared for, the breed can also usually live a very healthy life. There are some genetic conditions to be aware of, though: epilepsy, seizures, hypoglycemia, collapsed trachea, and bronchitis. Due to their extremely small size, two areas that will require veterinary attention are dental care and birthing, so keep that in mind when caring for your pup. 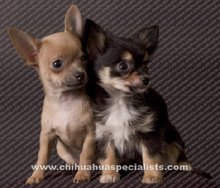 And while it”s not considered a birth defect or health issue, Chihuahuas have what is called a molera, or soft spot, on the top of their heads. They are the only known dog breed to be born with an incomplete skull. Most moleras close within several months of birth, but some do not. Again, it”s not considered a medical problem, but certainly something to be aware of when handling your Chihuahua. Grooming: – Happily, the Chihuahua requires very minimal grooming. They are known to shed, so a thorough brushing two times per week with a rubber mitt or soft bristle brush will do. Long-coated Chihuahuas can be groomed more often and they do shed seasonally, but a soft bristle brush two or three times per week (and a steel, small tooth comb to untangle knots from the tail, ears, and legs) will keep their coats shiny and healthy. Nails can be trimmed every two weeks or so, but if your dog”s size makes it difficult for you to safely make the cuts on your own, your vet or groomer can help. For more grooming tips, you can also contact your local Chihuahua breeder. Negatives: – The thing that makes them the most versatile …their small size…can also make them the most vulnerable. Chihuahuas have the hearts of lions, but their tiny bodies need some care, a lot of attention, and snuggly warmth from their loving owners. Your pup isn”t necessarily predisposed to be one of the snippy, spoiled ones, but it will require a consistent and firm (but gentle) hand from you. They are whip-smart, but need structure to avoid developing behavioral problems. Their tendency to bond and become overly-protective of one person in the family needs to be kept in mind, especially when others approach. They are untrusting of strange people and dogs, and a fierce, resounding bark will sound (not really, but the yipping can get pretty loud!). 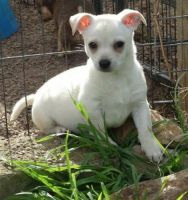 Positives: – The perfect size for a carry-all companion, long-living, sweet and loyal and happy just to be with you, the Chihuahua can make an ideal dog for many size families and homes. They are brave and bold, quirky and funny, intelligent and unfailingly loyal pets. Just think of all their kind has had to endure over the centuries! Who would have expected such spirit and fight and endurance from such a slight, delicate, tiny pooch? Well, Chihuahua owners, for one. If you ask them, they will be the first to tell you that Chihuahuas are the biggest little dogs in the world, and if you open your home to them, they will absolutely steal your heart!